There's a reason the Miniature Poodle has been – and still is – one of the most popular dog breeds in the world. They are fun, loving, high energy, and intelligent, which makes them a fun dog to have around the house. They’re intriguing, beautiful appearance also helps in this regard. They are highly loyal to their owner, but revel in being an intricate part of the family, so it is important to have them involved both inside and outside the house. It is important to teach them from a young age that they are not on top of the hierarchical order in the family, though, as they can become unstable when this is the case. Love and cherish them, for sure, but also make it clear what rung of the ladder they’re on. They enjoy socializing with other dogs and pets, and are very rarely aggressive towards other animals or humans. Because Miniature Poodles are highly intelligent, they also need a lot of stimulation to keep the occupied and challenged. It’s important to give them lots of socialization, both with humans and other dogs. A daily walk, in addition to a training or play session should be a part of their daily activities. They should not live outdoors, as they are not suited to do so. They can remain indoors for a good amount of time, but definitely need to get outside and be exposed to the elements daily. Poodles should be brushed every day – at least weekly – to bring out all the dead hair that accumulates in their coat, as it does not fall out naturally. Progressive Retinal Atrophy (PRA) is one of the more common ailments that Miniature Poodles can develop. This is the equivalent of cataracts in dogs. There is little that can be done about PRA, as it is inherited genetically. Contact your veterinarian if you see symptoms such as disorientation in low-light settings and increased eye-shine. Miniature Poodles are also prone to heart disease, epilepsy and Legg-Perthes – problems with the hips. They are less likely to develop glaucoma, urinary stones, intervertebral disk degeneration, and entropion, but they do occur. It’s suggested that Miniature Poodles have their eyes, knees, and hips checked out, as well as DNA tests for PRA and vWD. 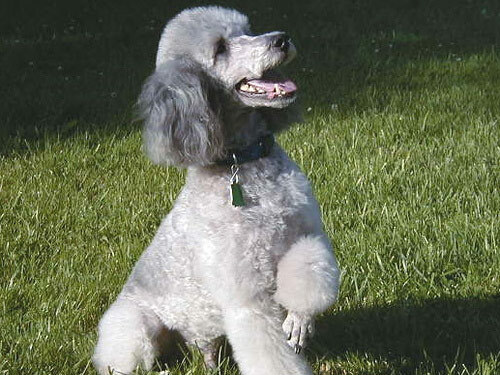 The Poodle was originally used for their unique water-hunting abilities. It is a great hunter of ducks for this reason. They were originally shaved close to the skin around most of their body to improve their swimming ability, but hair was left on the chest area to keep them insulated. They were also excellent herders, guard dogs, and military dogs. Contrary to popular belief, the Poodle does not have its origins in France, but rather in central Asia, eventually migrating to Europe along trade routes. Much of the Poodle’s breed development actually occurred in Germany. In the 1700’s, the Miniature Poodle gained popularity with royalty. The Poodle eventually became popular in America in the early 20th century, but succumbed to near extinction around 1920. By the 1930’s, though, they had re-emerged as one of the most popular breeds in America.